A commemoration ceremony planned for the 40th anniversary of the fall of Saigon at Camp Pendleton was canceled Friday because of a military rule forbidding the display of the former flag of South Vietnam on base, organizers say. The event was planned for April 25. 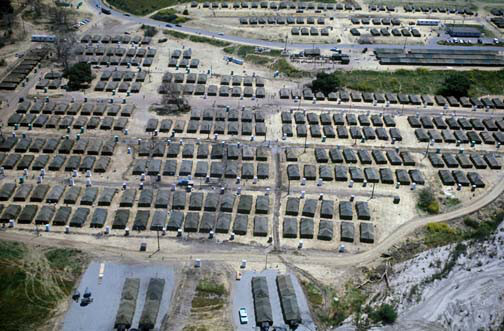 Camp Pendleton was one of four sites that built a tent city where more than 50,000 Vietnamese refugees lived while they waited for sponsors to help them resettle in the United States in the days immediately following the fall of Saigon. The organizers chose Camp Pendleton to host the event because of its historical significance. “Although we understand that on federal land, we must abide to federal protocol to not interfere with foreign policy plans, without the flag that countless people lost their lives for and without the song that reminds our community of the fight for freedom and democracy, this event cannot fulfill its intended purpose,” said Ngo Thien Duc, the organizing committee’s chairman. The event was to bring more than 5,000 attendees to Camp Pendleton, some of whom returning to the site for the first time since they first arrived in the United States. 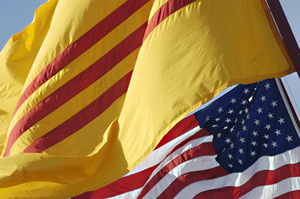 Ken Nguyen, the group’s spokesman, said although the yellow flag with three red stripes were recognized by numerous cities, counties and states as the flag representing the Vietnamese community in the US, it does not have federal recognition. Not having the flag at the commemoration event would be seen as an insult since so many lives — both Vietnamese and American — were lost to protect the values it stand for, he said. More than 50,000 American and 260,000 South Vietnamese troops lost their lives in the Vietnam War. Nguyen was one of the refugees staying at Camp Pendleton and said that he had hoped to bring his children and grandchildren to the event so that they can learn about this part of their history. Nguyen arrived at Camp Pendleton as a 20-year-old student working for the Camp’s processing center. He celebrated his 21st birthday there. He went on a first date and fell in love with his wife there. He and his wife have been married for 31 years now. The group said they hold no ill-will toward the base and understand the tough situation the base is in. The United States normalized relations with the Socialist Republic of Vietnam in 1995 and Tran Dai Quang, Vietnam’s Minister of Public Security, is currently visiting Washington D.C.
Officials from Camp Pendleton could not immediately be reached for comments. Typically, playing the national anthem and displaying the colors of countries not recognized by the US is not allowed on federal property, a Marine Corps spokesman said. The group now is planning the commemoration at another yet-to-be-named location in Orange County. In San Diego County, the USS Midway is hosting its own commemoration event on April 26, as well as a number of events hosted by local Vietnamese groups.